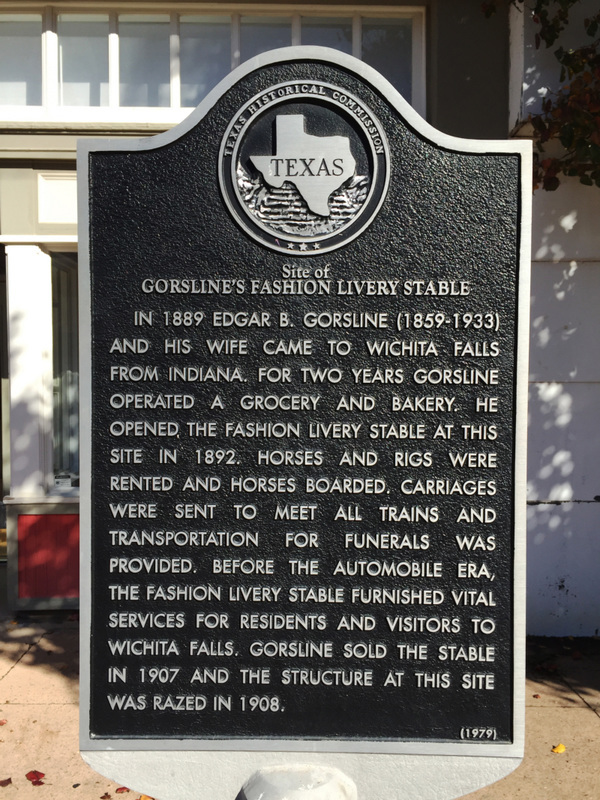 In 1889 Edgar B. Gorsline (1859 - 1933) and his wife came to Wichita Falls from Indiana. For two years Gorsline operated a grocery and baker. He opened the Fashion Livery Stable at this site in 1892. Horses and rigs were rented and horses boarded. Carriages were sent to meet all trains and transportation for funerals was provided. Before the automobile era, the Fashion Livery Stable furnished vital services for residents and visitors to Wichita Falls. Gorsline sold the stable in 1907 and the structure at this site was razed in 1908. Located on Indiana Avenue, across the street from the Museum of North Texas History, between Seventh and Eighth streets, Wichita Falls, Texas 76301. GPS 33-degrees 54; 45.7" _98-degrees 29' 27.6".